Valorie Kondos Field acknowledges the cheers. Gymnastics fans celebrated retiring UCLA head coach Valorie Kondos Field on Saturday afternoon in front of an emotional crowd of 12,270 in Pauley Pavilion on the Westwood campus. Kondos Field will retire at the conclusion of the season, her 29th as head coach. UCLA honored the career and lasting impact of "Miss Val" throughout the afternoon, with many gymnastics alumni in attendance. In a pre-meet ceremony, UCLA Director of Athletics Dan Guerrero announced that all future gymnastics competitions in Pauley Pavilion will take place on the newly named Valorie Kondos Field Floor. The Bruins went on to defeat Utah State 197.575-194.850 to end the regular season. In her 29 years as coach, Kondos Field guided UCLA gymnasts to a record of 528-121-3 and seven NCAA championships. The four-time national coach of the year and Pac-12 gymnastics coach of the century winner has also seen her teams rack up 14 conference and 19 NCAA regional titles. Without exception, for 37 consistent years every time I walk through the doors of Pauley Pavilion I get the sensory reminder that I am, indeed, on hallowed ground. From athletic championships to rock concerts, presidential debates and awards shows, Pauley Pavilion has been an elegant and regal host to some of the most significant people and events of our time, including the Dalai Lama, Barack Obama, George W. Bush, Jay-Z, The Who, Justin Bieber, Luciano Pavarotti, The Grateful Dead, Frank Sinatra, Dean Martin and Sammy Davis Jr. to name just a very few. Pauley Pavilion also hosted the 1984 Summer Olympics and provided the stage for Mary Lou Retton and our USA men’s gymnastics team to earn gold for the first (and only) time in U.S. history. Pauley Pavilion has been the home to some of the greatest athletes of all time in basketball, volleyball and gymnastics, none held in more regard and sanctity than our own Coach John Wooden. 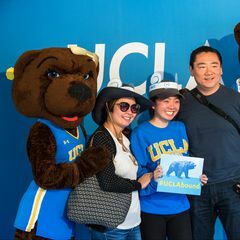 The next time I enter your doors I know I will be home, but I will have passed the torch to the next leader of UCLA Gymnastics. Thank you for providing me with the grandest of arenas from which I got to hone my craft as a coach and a leader. It has been one of my greatest honors. 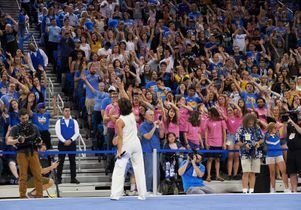 Before Kondos Field left the floor at Pauley Pavilion, past and present UCLA gymnasts, friends and the visiting Utah State team — even mascots Joe and Josie Bruin — joined in a flash mob style dance celebration of the coach known for her dance routines. Watch below. 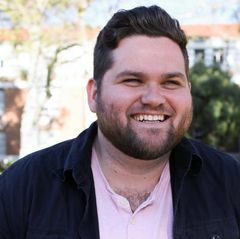 The Los Angeles Times, covering Saturday's festivities, called Kondos Field "a Bruins legend." As the end of her 29th year as head coach approaches, the coach who dances with the student section and implores her athletes to circle the stands giving high-fives has bid farewell to Pauley Pavilion. 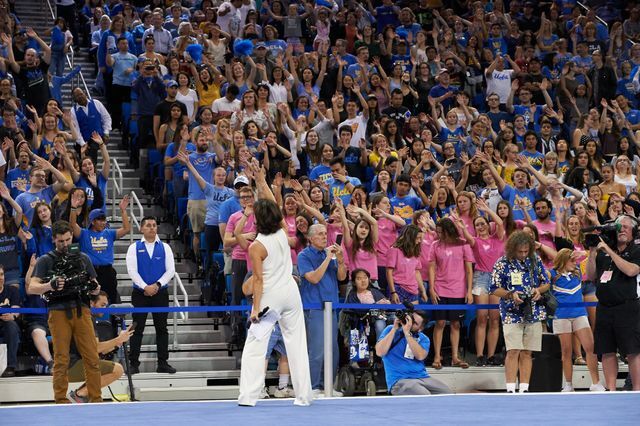 UCLA gymnastics alumni filled the stands, and broke into a flash mob on the floor once the meet was done. “Amazing,” Kondos Field described their dance, drawing out the word. UCLA Gymnastics put together a video tribute to her career. Afterward, Kondos Field tweeted her appreciation. Kondos Field with her athletes on Pauley floor. Valorie Kondos Field acknowledges the crowd at Pauley Pavilion celebration. Valorie Kondos Field at the center of celebration at Pauley Pavilion. Valorie Kondos Field bathed in love at Pauley Pavilion. Valorie Kondos Field appreciates the crowd at Pauley Pavilion celebration.